The Management of Myelomeningocele Study (MOMS study) began in 2003 and lasted 7 years. They were going to study 200 babies, but ended up concluding the study at just over 180. The reason the surgery came to be is because doctors noticed that nerve function lessons during a babies time in utero. The idea is that doing a surgery in utero prevents further nerve function loss and, therefore, lessens the effects of spina bifida. It is a controversial idea, however, as spina bifida is not, in itself, life-threatening, and therefore, the surgery is not needed to preserve life. In order to determine if the surgery is effective, mothers who decided to participate were randomized in to two groups; those that would have the prenatal surgery and those that would have the postnatal surgery. If you were chosen for prenatal surgery, the surgery was done by one of the MOMS surgeons in one of their facilities at between the 19th and 25th week of pregnancy. Moms then stayed close to the facility until they were 37 weeks and had their child born via c-section by one of the MOMS doctors. If you were chosen for the postnatal surgery, you were sent home but then were asked to return and were given a c-section at 37 weeks and the postnatal surgery was completed by one of the MOMS surgeons in one of their facilities. Wound infection after the fetal surgery. Intrauterine (in the uterus) infection. If this occurs the baby will need to be delivered right away. Amniotic fluid leak. If it occurs, the mother will probably need to be admitted to the hospital to be treated with bed rest and IV (intravenous) fluids. She may need to stay in the hospital until delivery. Loss of ability to have more children. Significant bleeding during the fetal surgery. Side effects from any medications needed before, during, or after surgery. Side effects depend on the specific medications used. Complications from general anesthesia. This risk is no higher than for any other surgery requiring general anesthesia. Effect on future pregnancies and deliveries. It is recommended that mothers do not labor during future pregnancies and deliver by C-section instead. Psychological stress. There are risks of depression in both groups of women. There is the potential for placing a psychological burden on the family because of the demands of the study, including having to stay away from home and the need to travel to the MOMS Center several times. Further damage to the spinal cord and nerves from the prenatal surgery. Prematurity. Fetal surgery can result in early delivery. The earlier the baby is born, the higher the chance that they will have problems associated with prematurity. Membrane separation. The fetal surgery may cause the tissues surrounding the baby and amniotic fluid to separate from the uterus causing early delivery or interference with the blood flow to some part of the baby such as an arm or leg. In the intention-to-treat analysis, the first primary outcome — fetal or neonatal death or the need for a cerebrospinal fluid shunt by 12 months — occurred in 68% of infants in the prenatal surgery group vs 98% in the postnatal surgery group, a relative risk reduction of 30% (relative risk, 0.70; 95% confidence interval [CI], 0.58 - 0.85; P < .001). Actual rates of shunt placement at 12 months of age were 40% and 82%, respectively, yielding a relative risk reduction of 52% with prenatal surgery (relative risk, 0.48; 97.7% CI, 0.36 - 0.64; P < .001). At 12 months, the proportion of infants with no evidence of hindbrain herniation was higher in the prenatal than the postnatal surgery group (36% vs 4%) and the rate of moderate or severe hindbrain herniation was lower (25% vs 67%). At 30 months, prenatal surgery relative to postnatal surgery also resulted in a significant improvement in the composite score for mental development (Bayley Mental Development Index) and motor function (P = .007). Forty-two percent of children in the prenatal surgery group were able to walk independently without orthotics or devices vs 21% of children in the postnatal surgery group (P = .01). Dr. Adzick and his colleagues note in their report that although the prenatal surgery group had better outcomes than the postnatal surgery group, "not all infants benefited from the early intervention, and some had a poor neuromotor outcome." Going forward, "we need to refine things in terms of diagnosis and figuring out which fetuses with spina bifida will benefit the most," Dr. Adzick told Medscape Medical News. Prenatal surgery was associated with higher rates of maternal and certain fetal complications, including spontaneous membrane rupture (46% vs 8%), oligohydramnios (21% vs 4%), preterm birth (79% vs 15%), and more complications associated with prematurity, such as respiratory distress syndrome, which was seen in one fifth of infants in the prenatal surgery group. One third of women who underwent prenatal surgery had an area of dehiscence or a very thin prenatal uterine surgery scar at the hysterotomy site. In their commentary, Dr. Simpson and Dr. Greene emphasize the need for explicit risk-benefit conversations with women contemplating prenatal myelomeningocele repair. "For many women, the 20% absolute improvement in ambulation at the age of 3 years and the decreased need for shunting may be perceived as sufficient to justify the increased risk of maternal complications, but it should be recognized that outcomes after prenatal surgery were less than perfect in MOMS. As you can see, the surgery helped to greatly lessen the amount of kiddos that needed shunts (which is HUGE... shunts really stink. Well, ok, I admit that shunts are amazing and life saving, but they also come with their own risks). It also helped with increased mobility and decreased the number of kids borth with a Chiari II malformation. I read that they are unsure if it has helped with bowel and bladder issues and will be studying that further as they continue to follow the children that participated in the study. On the down side, over 80% of the babies were born prematurely, averaging 1 1/2 months premature. Obviously there are many advantages to participating in the surgery, however there are also many risks. On a side note, I have read about a few children that participated in the study and were born with spina bifida, but also cerebral palsy. I noted that this was not addressed in the results. I have always wondered if the cerebral palsy was due to a reduced oxygen level in utero, which is one of the side effects they list (Membrane separation. The fetal surgery may cause the tissues surrounding the baby and amniotic fluid to separate from the uterus causing early delivery or interference with the blood flow to some part of the baby such as an arm or leg). I would be curious to see if they felt the surgery contributed to the cerebral palsy or not. Now I will tell you a little bit about our dealings with the study and why we made the decisions we that we did concerning the study. We were offered the study and met the qualifications, but of course, we did not know which group we would get randomized in to. We have a great support group and David is blessed with a flexible job, so we would have been able to participate logistically as well. I was about to say "yes" when I decided it would be best to talk to Madi's neurosurgeon and see how he felt about the study. I had read the risks of the surgery and, basically, I wanted to know if the benefits outweighed the risks. It was actually very interesting that her neurosurgeon is Dr. Moss because he was offered a positition to be one of the doctors to do the surgeries for the MOMS trial, but he had turned down the offer due to his beliefs on the study. In a nutshell he told us that he was not seeing enough positive research coming from the study and that he felt the risks did not outweigh the benifits. He said that a child's level of functioning is all a guess until they come, so it is really impossible to say for sure that the surgery made them higher functioning. He told me they had lost a few babies due to them being born so early, and that many others had some very serious complications from being born so early. He said that having a baby born prematurely could possibly lead to many more complications and that those complications were not worth the risk. After talking with him I talked to a few mothers who participated in the study. Some swore by it, saying that they felt very strongly that it helped their child. Others were not so sure it did help or were not happy with some of the complications their child had due to their premature birth. Contemplating all of this and deciding what to do was incredibly hard. One on hand, I wanted to do anything I could to help my daughter. I was not worried about any of the risks to me, because I would risk everything for her. I was, however, worried about the risks to her. I had already denied having an amniocentesis done because of the small chance of it causing me to miscarry (and because I wanted the doctors to operate on her like she would live to be 100, and if she had any chromisome abnormalities, I did not want them to know). I kept going back to the fact that I could help her, but that I could also loose her. I decided that I could not risk loosing her, period, and David felt the same way. We would deal with whatever life brought us, but we wanted her with us, living that life with us. It was a very, very hard decision to make, however, I do not, for one second, regret it. It was the right decision for us. My thoughts on the surgery are that it is amazing and a step in the right direction. I feel that it is essential to continue the research and believe that they need to now focus on finding ways to lessen the risks so that the surgery can be more of a benefit to children. I am thankful that so many families stepped up to participate in the study, as we would not have this information without them. I am glad to see many families happy with their decisions to persue the surgery and feel that they made the right decision for their children. I also believe that those who decided not to persue the surgery made the right decision for their, as both sets of families were following God's plan for their child, and that is what is important. 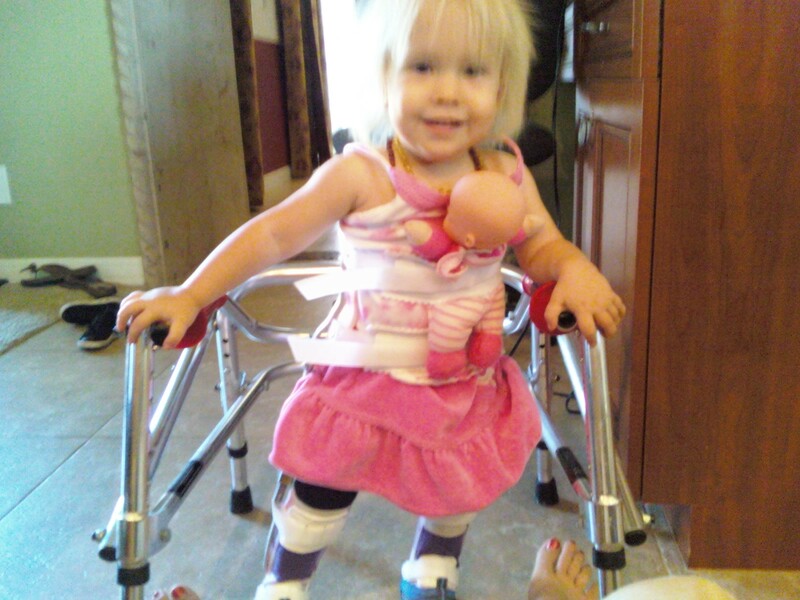 I am hopeful that the advances in technology we are seeing will change how spina bifida impacts our precious children. But, with all of that said, I am choosing not to ask "what-if". I think Madi is amazing just the way she is because she is just the way God designed her to be. I do not regret the decision that we made for her. Great post and very informative. I hadn't had time to read through all of the results yet so your post was great. We were not eligible for the study because we had twins. I kind of think that was a gift, I think it would be a very difficult decision to make either way to be a part of the study of not. I know people who have been a part of it and have had wonderful and positive outcomes and others like you who are at completely at peace not to have taken the extra risks. I do like at least that Spina Bifida is getting some much needed attention in general because of the stufy at least!! your daughter is beautiful and doing awesome!!! I do not know much about spina bifida, so this was helpful to read! Madi looks *precious* in this picture. I love how her baby matches her and she is wearing her! Thank you for this post. I just decided this week not to have the fetal surgery. Your posted just reassured me that I made the best choice for my little one. I only wish I would have come across your post sooner. I didnt do the fetal surgery. Noah did not have hydrocephalus or Chiari II. During my pregnancy, his brain was normal but he did have bilateral severe clubbed feet and other issues. I'm happy we visited the fetal surgery center at CHOP during my pregnancy. They told us more about what to expect post birth. That's wonderful that they helped prepare you! Feeling prepared was just huge for us!